Berwick tried to find a breakthrough against Montrose but drew a blank on the day. Berwick’s league future remains ever more precarious following a home defeat at the hands of Montrose, who in so doing hauled themselves into the play-offs at the other end of the table. Chris Templeman scored the only goal of the game in the first half in a game both teams were desperate to win. In the first minute the ball was cut back into the box but Rangers’ Michael McKenna missed the ball completely with his kick. There wasn’t much by way of goalmouth action in the opening 20 minutes, but Steven Thomson forced Allan Fleming into a good reaction save as he attempted to fire across goal almost from the byeline. Gary Fraser tried his luck from outside the box, but Montrose’s top scorer was always high and wide. Montrose always looked the more likely side to score, and they took the lead after 38 minutes when Chris Templeman smashed the ball into the roof of the net after Berwick failed to clear a long throw-in into the box by Iain Campbell. And just two minutes later Templeman went close to adding a second when he headed narrowly wide from a Campbell corner. Darren Lavery, in his 200th game for Berwick, got in behind the visiting defence, but from an acute angle he was unable to hit the target. It was a disappointing showing from the home side and at half-time they trailed 0-1. Early in the second half Thomson tried his luck from distance and Fleming pushed the ball away for a corner. From the set piece Jonny Fairbairn rose first but was unable to direct his header on goal. 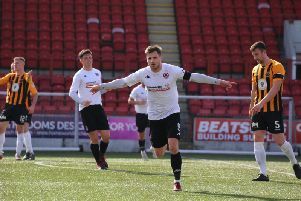 Manager John Coughlin grew increasingly frustrated as he watched from the sidelines and Stevie Notman tried to ease the pressure with a half volley from the edge of the box which went wide. McKenna fired in a free kick after 72 minutes which Fleming acrobatically pushed over for a corner from under his crossbar. Greg Rutherford, who was starved of quality serve for most of the afternoon, had a great chance to level for Berwick in the 82nd minute, but his close-range effort was blocked by Fleming with his feet and looped over the bar. In injury time Gary Phillips pulled a shot wide for Berwick, but again this was not to be their day. Montrose rarely threatened in the second half, but they had done enough to take the points. Berwick: Brennan 6, Hamilton 6 (Verlaque 85), Spark 6, Notman 6 (Murrell 69), Scullion 6, Fairbairn 6, Thomson 7 (Kessels 83), Lavery 7, Rutherford 6, McKenna 7, Phillips 6. Montrose: Fleming 7, Ballantyne 6, Campbell 7, Watson 6 (Thomas 76), Allan 6 Steeves 6, Webster 6 (Ferguson 63), Masson 6 (McWalter 81), Fraser 7, Templeman 7, Smith 6.